Lee Ballard is interviewed by fellow graduate student and FLA Editor, Tyler McPeek. 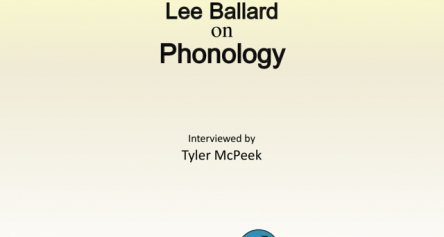 Ballard discusses his specialty, phonology, parallels between music and linguistics, optimality theory, and his University of Florida, Spring 2010 Masters Thesis topic. Dong-yi Lin is interviewed by fellow University of Florida graduate students and FLA Editors, Lee Ballard and Tyler McPeek. Mr. Lin discusses his motivations for specializing in the Kavalan language and Austronesian languages generally. Lee Ballard interviews his grandmother, Ms. Evelyn Johnson, on her encounters with different languages as a traveler and missionary abroad, as well as her views on and familiarity with different American southern dialects. Enjoy the down-home sound of Ms. Johnson’s very own charming southern accent! FLA Editor Lee Ballard has two grandmothers, one from his mother’s side and one from his father’s side, who knew?! In this interview, Lee interviews his second grandmother of the holiday season, learning something of the importance of prescriptive grammar from the perspective of an old school public school teacher of the French language in America. Virginia Ballard hailed from a family of school teachers and shares her opinions and views on the importance of language education with us. Let’s listen up (insert crack of wooden blackboard pointer on your desk here) young men and women! Insights and wisdom abound! Bow to the Old School Noam Chomsky!! Jaffer Sharief sits down with FLA Editor Lee Ballard to discuss his experiences growing up in a hyper-multilingual environment in Bangalore, India. 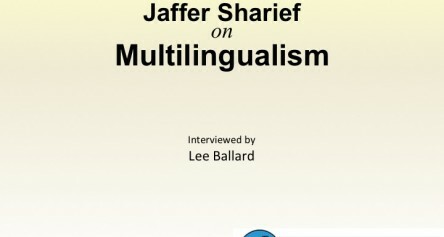 Perspectives on life as a masters student in America and encounters with American accents and dialects are covered, as well as Sharief’s thoughts on multilingualism generally. 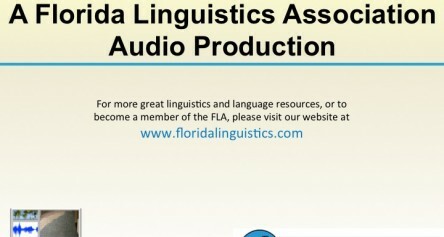 FLA Editor Lee Ballard gives an introduction to phonetics. 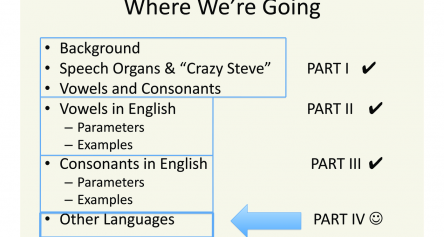 This segment is devoted to the phonetics of languages besides English.